Do you know the last words of a lake county redneck? Let’s not forget the viral classic “douse yourself with a bucket of ice water.” Doesn’t matter that it was for a good cause – which I can’t remember right now. Whatever, man. If you want to plumb the depths of stupidity try this: Nikolas Cruz took an Uber ride to the Parkland high school….CARRYING HIS AR-15 AND AMMO BAG…and the adult driver didn’t think that was odd. Hi TL … Yep … I wondered how he made the Uber ride without arousing suspicion … probably could break the AR15 down … but he did the shooting and was arrested in a maroon short sleeved T-shirt so i supposed he rode over in that get up. Watching all those teens is awesome … Personally, I think it bodes well for our future that a large number of teens 14-18 are more intelligent and can express themselves better than the current temporary resident in the WH. Thanks for reading … and for your support. Sorry. I have to (again) applaud some Florida teens. “Companies, trying to make caricatures of the teen-agers nowadays, say that all we are are self-involved and trend-obsessed and they hush us into submissions when our message doesn’t reach the ears of the nation, we are prepared to call B.S. I plan to support them. It’s obvious the “adults” haven’t gotten anywhere! Hi Joy … I think you’re right … these kids have a handle on the problem and won’t let go until they have achieved their goal. They’ve latched onto the support systems already in place for other large movements and now have some big money behind them … Let’s hope they can make a difference … the adults in Congress sure have not! UGH! 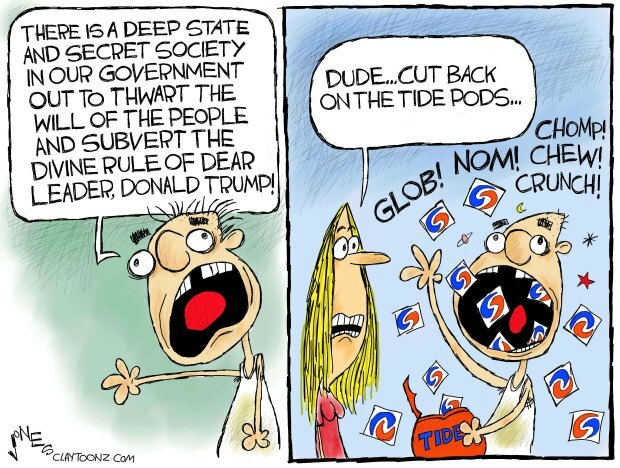 In another universe, Tide Pod Challenges and the coming need for all to carry a weapon would be absurd, seriously! Sadly, in this universe, they ain’t. When I went to search for some Tide Pod Challenge info, I clicked on a page with a news story illustrated with a picture of a white male teen, mouth open with a Tide Pod lightly grasped by his thumb and forefinger poised to enter his mouth. Here’s what rubbed ME … the image has a Scripps Media copyright … and no one with Scripps Media thought about how this image might be perceived.